Number of Electrons - What are Electrons? Electrons are tiny, very light particles that have a negative electrical charge. Electrons are negatively charged, circling the nucleus, making it a neutral, orbital particle. Protons are much larger and heavier than electrons and have a positive charge. Electrons are positively charged and located in the nucleus together with the neutrons. Electrons have a charge of +1 and a mass of approximately 1 atomic mass unit (amu). 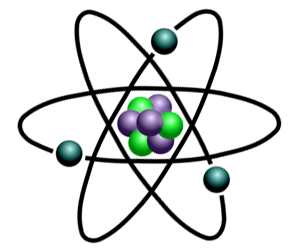 The atomic number is based on the number of Protons in the atom of an element. (Note: Atoms must also have equal numbers of Electrons & Protons.) So, if we know the atomic number of an element then we also know how many Protons are in an element and therefore the number of electrons in an element. Example 1 - Number of Protons in Gold: The element Gold (Symbol Au) has the Atomic Number of 79. Any atom that contains exactly 79 protons in its nucleus is an atom of gold. The number of protons in atom of gold is therefore 79. And as there must be an equal number of electrons and protons in an element there must also be 79 Electrons in the element. Example 2 - Number of Protons in Silver: The element Silver (Symbol Ag) has the Atomic Number of 47. Any atom that contains exactly 47 protons in its nucleus is an atom of silver. The number of protons in atom of silver is therefore 47. And as there must be an equal number of electrons and protons in an element there must also be 47 Electrons in the element. Example 3 - Number of Protons in Neon: The element Neon (Symbol Ne) has the Atomic Number of 10. Any atom that contains exactly 10 protons in its nucleus is an atom of gold. The number of protons in atom of gold is therefore 10. And as there must be an equal number of electrons and protons in an element there must also be 10 Electrons in the element.